While drinking plenty of water is critical to life, health and healing, simply submerging your body in water (i.e., a pool) opens up opportunities for relief and fitness for those who otherwise may have difficulty exercising. Although many of our athletes and runners love the pool, this is also especially important for aging adults and those with chronic conditions. The buoyancy of waist-deep water, for example, can support around half our body weight, while neck-deep water can reduce body weight by up to 90 percent. Such reduction in weight and impact on the joints can help people who may experience difficulty standing, balancing and exercising on land to move more freely – and often with less pain. In addition, water offers 12 times the resistance of the air around us. Because of this added resistance, movement and exercise while submerged in a pool can help build overall strength and stability in the body. This makes pool exercise, and even aquatic rehabilitation (physical therapy in the pool) when needed, ideal for the aging adult whose goal is to simply maintain a strong, stable and healthy body, ensuring they’re able to keep up with their active lifestyles outside the pool. A warm pool can both soothe muscles and joints while simultaneously keeping you strong and in optimal health. One study published in Medicine & Science in Sports & Exercise back in 2007 showed that older women who regularly participated in a pool-based exercise program performed better in daily tasks than others who exercised similarly on land. The women in the study, for example, improved their walking speed by 16 percent, their agility by 20 percent, and their ability to walk stairs by 22 percent. Even when people suffer from common chronic diseases like arthritis and osteoporosis, water exercise can help improve the use of affected joints while decreasing overall pain. This can also be applied to people who are recovering from injury or surgery. With the guidance of a physical therapist, the pool can be an effective rehabilitative tool for helping people recover while improving strength, confidence and function. Those who feel pool exercise or aquatic therapy may help them improve fitness levels or overall functional abilities should first contact their physical therapist for professional guidance. Shoulder pain in older adults often appears suddenly, as if caused by a sudden trauma or injury. But for many shoulder injuries can often the result of musculoskeletal conditions directly associated with wear over time and, more specifically, weakening posture. Shoulder impingement is the result of chronic and repetitive compression of the rotator-cuff tendons in the shoulder, causing inflammation, pain, weakness, and a decreased range of motion in the joint. The condition can be caused by repetitive overhead movements such as those performed by golfers, swimmers and racquet sport athletes. The key to preventing shoulder impingement is regular mobility – moving and stretching your shoulders daily in order to stay loose and counteract the effects of declining posture. To do so here are some exercises to include as a part of your regular exercise regimen. Back Extension/Shoulder Flexing Stretch: Sitting in a chair, hands clasped together, reach your arms high above your head and slowly reach backward, extending your head and hands behind you. Hold for a few seconds, relax, and then repeat. Backward Shoulder Extensions: Standing upright, your fingers interlaced behind your back, slowly lift your arms away from your buttocks and toward the ceiling. Lift as high as you can. Keep an upright stance, hold for a few seconds, release, then do it again. Up-Back Shoulder Reaches: Reach one arm behind your back and, palm facing out, slowly reach up the small of your back toward the space between your shoulder blades. Hold for a few seconds, release, then do the same with your other arm. Repeat one time each. Down-Back Reaches: Reach your hand behind your head and down your back. Hold for a few seconds, release, and then do the same with your other arm. Repeat one time each. Maintaining a healthy shoulder and preventing the onset of shoulder impingement translates into staying active, playing with the kids, comfortably reaching that top shelf in your cabinet, and even sleeping more comfortably. Do these exercises but if it’s still not working, of courese a physical therapist can help you get there – or stay there – by thoroughly evaluating your condition and setting you on a personalized path toward pain-free motion. Everyone is going wild over the competition of the NBA Playoffs. It’s nice to see some close games in the post season. Can you even imagine the potential of the NBA finals without Lebron? As much as we love the post season, it is often a common time for injury. After all, players have played up to 82 games, not including practice, scrimmage, and workouts. By the time of the postseason, those small regular season hiccups can build up to eventual injury. Chris Paul was just officially pulled (no pun intended) from game 6 of the Warriors-Rockets Game due to a right hamstring strain. The big questions is, will he return if there is a game 7? Well, here’s what you should know about the hamstrings. It is a huge muscle. If you’re being fancy, the hamstrings actually consist of 3 muscles together (the semimembranosus, the semimembranosus, and the biceps femoris) It connects from your hip to your knee and is responsible for stabilizing the hip and the knee. Without the hamstrings working at full capacity, the ability to bend the knee and extend the hip to stand tall (as when moving from a crouched or defensive position) becomes very difficult or painful. The same movement is needed for sprinting as well, so you must to have them working to make that fast break on the court. The big question is “how bad was the strain?” Hamstring strains can be grade 1, grade 2, or grade 3. Grade 1 strains are mild and usually just a few muscle fibers have been damaged. With a grade 1 strain the athlete can usually still bend their knee normally and typically are able to walk fine and maintain their normal power and endurance. They might be sore the day after the injury still. Grade 2 strains are moderate in nature and the athlete typically feels pain when the knee has to bend or the hip has to extend against any resistance. This usually makes sprinting pretty difficult. So, what will happen in the short term to get him back on track? Most likely his rehab team will explore the use of things like massage, ice and or heat, taping, dry needling, cupping, electrical stimulation (maybe a little prayer) to get him back on the court in the case of a game 7. Don’t be surprised if you see him on a stationary bike courtside to keep his muscles warm when he returns. Long term in the offseason, he will have to look at a rehab and prevention program that consists of eccentric muscle training (a muscle is holding a contraction while it lengthens) such as is done with Nordic Hamstrings Exercises. Rehabilitating the entire lower extremity for coordination of his lower extremity muscle groups, balance, and agility will get him ready for the next season. So, the big question is, can he return to play. Well that just depends on how bad the strain was. My bet is that considering the circumstances, his potential impact, and the fact that he was at least able to walk off the floor after the injury, they will figure out a way to get him back in the game. Remember though, that is just for Chris Paul (you know, NBA star Chris Paul). If you just suffered a hamstrings strain and a playoff series is not at risk, how about letting it rest just a little before getting back. Digging out boxes of holiday decorations, hauling packages to and from the car, hiding gifts away on the higher shelves at the back of your closet … the Holiday Season certainly requires its fair share of bending, lifting and reaching. This,coupled with the cooler weather, makes December the ideal time for a refresher on proper lifting methods. Back pain and injury can put a real damper on the Holiday Season, yet it’s one of the most common conditions we treat as medical professionals. Fortunately, it’s also a condition that’s very preventable, and one of the ways to keep the spine healthy is learning – and practicing– proper lifting techniques. When we talk about proper lifting techniques, we’re talking about protecting the back, yes, but we’re also looking to minimize strain on the entire body. The goal is to put yourself in a position that allows the body’s musculoskeletal system to work as one cohesive unit, without putting too much strain on one area, such as the lower-back or shoulders. Warm Up: Don’t ever assume your body’s ready to lift heavy objects without first being thoroughly warmed up. Take the time to stretch your lower back as well as your legs and hips. Give a few jumping jacks a try to get the blood flowing to the muscles in your body. During the process of lifting, keep from twisting or reaching while carrying a load. Don’t rush through the process of lifting, and if you’re tired, put it off until later. Whatever you do, protect your body and prevent injuries and enjoy the holiday season. Most medical experts in agreeing that young athletes generally remain mentally and physically healthier, achieve greater success, and learn to enjoy a lifetime of physical fitness when they opt to play multiple sports. Specializing in a sport is fine, but we should be aware that allowing youth to specialize in a sport year-round can lead to burnout, a greater risk of experiencing overuse injuries, and less long-term success. While this path has worked out for some, these stories are very rare and overlook the fact that the risks of specialization far outweigh the rewards, especially when it comes to youth athletics. It’s been estimated that up to 60 million U.S. youths ages 6 to 18 years participate in some form of athletics. More than 5 million of these athletes experience an injury each year. According to the American Academy of Pediatrics, at least 50 percent of athletic injuries are related to overuse, the types of injuries for which one-sport athletes are particularly prone. An overuse injury happens when a bone, muscle or tendon has been put through repetitive stress without being given a sufficient amount of time to heal or repair, leading to microtraumatic damage. Think sore pitching arms or pain in a swimmer’s shoulder that doesn’t go away, possibly keeping the athlete from competing. The same repetitive motions year-round can, in other words, lead to such overuse injuries as strains, sprains, stress fractures, and even tears in muscles, tendons and ligaments. Playing multiple sports, in contrast, allows young athletes to challenge their bodies in different ways, developing new sets of physical traits and skills and that offer more universal performance benefits. Watch for Signs: If a young athlete complains of nonspecific problems with muscles and/or joints, physical fatigue, or grows concerned about poor performance, visit a physical therapist, who can fully evaluate the issue and offer treatment (if needed) for any potential injuries or deficiencies. While we watch Alpine skiers speed through difficult downhill courses and figure skaters bound balletically across the ice during these Winter Olympics, I can see the importance of two oft-overlooked elements of good fitness and training routines: of balance and flexibility. When we work to prepare our bodies for a certain activity, or simply for the rigors of living an active lifestyle, we shouldn’t only be focusing on strength and cardio. It’s a good start, but if your balance and flexibility are below par, performance will be limited and the body will be more susceptible to injury. Few things highlight this more than winter sports and activities, such as those featured during the Winter Olympics because they provide the ultimate challenge to balance and flexibility. Both balance and flexibility work together to keep these athletes upright while they adapt to new terrain, changes in position, etc. The importance of this is obvious on snow and ice, of course, but the same concept applies in everyday life. Whether your personal goals include competing better athletically, getting outdoors more for hiking, cycling or (yes) skiing, or simply feeling safer and more confident playing in the backyard with the kids, good balance and flexibility are key. To help improve balance and flexibility in your life check out these three tips. Take an Exercise Class: Yoga, Pilates, step classes … they all strive to strengthen your core muscle groups, which are essential in achieving good balance. Plus, these classes often complement indoor cardio and resistance training – training that may do little to help with your balance. Stretch Every Day: Take 10 to 15 minutes each day to stretch, either in the morning or just before bed. A stretch right before an activity will do little to help you out unless you’ve worked to establish a higher level of flexibility over the long term. Perform Single-Leg Balance Exercises: Get your body accustomed to relying on one side at a time. Practice standing on one leg while tilting your body forward, back and sideways. Place your hand on a wall, countertop or piece of furniture if you need help balancing. Other single leg balance ideas include ball bounces, standing on a foam pad, and practicing with eyes closed … all in a safe setting, of course. For a more individualized approach of our course, a physical therapist can help but in the meantime, give one of the tips a try. It’s estimated that about 29 million Americans each year hit the links for at least one round of golf. That’s 1 in 10 people in the U.S., according to the National Golf Foundation. But while golf is often considered a safe, low-impact, leisurely activity for people of all ages and abilities, that impression vastly underestimates the impact golf has on the body. From sudden, acute injuries due to poor form or the lack of flexibility, to the development of long-term, overuse injuries caused by excessive play or poor swing mechanics, a round of golf can turn from leisurely to debilitating without proper training and conditioning. People love to play golf because it’s challenging and competitive while, for the most part, remaining nondiscriminatory based on age or fitness level, but there’s no denying that golf as a sport is associated with a significant number of injuries each year – conditions that can keep you off the links while affecting other aspects of your life. According to the U.S. Consumer Product Safety Commission, more than 131,000 people were treated in hospital emergency rooms, doctors’ offices and other clinics for golf-related injuries in 2015 alone. 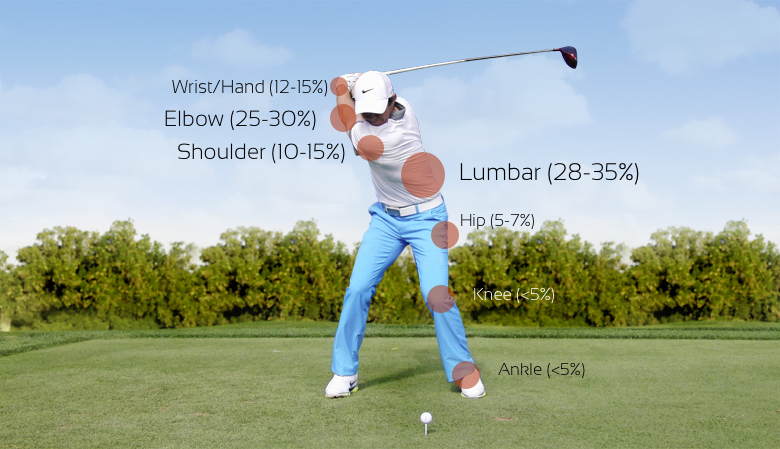 The most common injuries affected golfers’ backs, shoulders and elbows. The most common golf injuries tend to happen either when a golfer jumps into a season or round too quickly, before the body’s prepared for the rigors of 18 holes or they come from playing and practicing too much – without proper rest – which can lead to overuse injuries like back pain or golfer’s elbow. Studies by the American Orthopaedic Society for Sports Medicine (AOSSM) have shown that both are real issues within the golf community. For instance, AOSSM says that more than 80 percent of golfers spend less than 10 minutes warming up before a round. At the same time, about 44 percent of all reported golf injuries in youths are from overuse. Proper Mechanics: Your swing isn’t just important for accuracy and length. Proper mechanics keep you from placing too much strain on your back, elbows, shoulders … really your entire kinetic chain, from your feet to your head. A Warmup Routine: If you’re one of the 80 percent of golfers who spend less than 10 minutes warming up, you’re just asking for injury. Instead, develop a regular and reliable stretching and warmup routine for use prior to each round that promotes flexibility, increases your heart rate, and gradually works your body up to swinging the driver. Professional Advice: A golf pro can help you with mechanics, but a physical therapist can ensure your body is up for the rigors of performing these mechanics through nine or 18 holes. A full assessment from a physical therapist can help a golfer identify imbalances in strength and flexibility, from which a PT can provide him or her with a path toward addressing these deficiencies with an eye toward injury prevention and improving the golf game. Pain affects more Americans than diabetes, heart disease and cancer combined (American Academy of Pain Medicine). If you are like most people, you probably want to get rid of it as quickly as possible. Fortunately, there are many options out there for pain management that can be help without long term use of pain medications. One of those options include Trigger Point Dry Needling. Now I know you’re thinking, “a needle! Oh my!” No worries. It’s not quite what you think. Dry needling is a treatment that has been safely provided by physical therapists since the 1920’s that has recently had a resurgence in use. It involves a very thin monofilament type of needle that the physical therapist pushes through the skin to stimulate trigger points (really tight areas within the tissue) and muscles to help them to relax, to restore motion, and decrease pain. Many athletes, runners, dancers, use dry needling as a part of their normal rehab routine. Most people report that they don’t really feel anything with the initial stick until the needle gets into the muscle. Then there is often a very quick muscle contraction that is more surprising than it is painful. Afterwards, the client usually demonstrates improved range of motion and reports decreased pain. After treatment, there might be a muscle soreness similar to what one would feel after exercise but once this is gone, oh the joy of decreased pain! Now, remember, this is not magic (although it would be really cool if it were). Dry needling is one of the many tools that physical therapists can use to help restore motion and decrease pain. Your therapists can perform a thorough evaluation to help determine if you are a good candidate for this as a part of your treatment program to reduce your pain and improve your function. Do you ever find that you have frequent headaches when you get stressed? Have you ever wondered why this happens? Tension headaches are typically the type of headaches that occur with stress. The pain from these headaches is frequently felt in the back and/or sides of the head, often spreading to the eye. Most people treat this type of pain with medication, but is this the best solution to address the underlying problem? “You need to exercise and lose 10lbs.” This is often the dreaded feedback from medical practitioners to people who have pain in their joints. Whether it is in the knees, hips, ankle, back or shoulder, none of us really want to exercise through pain. If you think about it, this makes perfect sense anyway.